At the end of the nineteenth century, Theodore Roosevelt, T. S. Van Dyke, and other elite men began describing their big-game hunting as “manly sport with the rifle.” They also began writing about their experiences, publishing hundreds of narratives of hunting and adventure in the popular press (and creating a new literary genre in the process). But why did so many of these big-game hunters publish? What was writing actually doing for them, and what did it do for readers? In exploring these questions, The Hunter Elite reveals new connections among hunting narratives, publishing, and the American conservation movement. 1. When did you first have the idea to write The Hunter Elite? I started out planning to write about exploration and hunting at the beginning of the twentieth century—originally I wanted to examine how wealthy travelers and their guides interacted on expeditions, and this was a great period to study because there were so many narratives published. The more I read, though, the more interested I got in the narratives themselves, just the sheer number of them, and I started asking why so many hunters and amateur explorers suddenly started writing down and publishing their experiences around the turn of the century. That led me into looking at publishing in that era and thinking about what kinds of stories hunters were selling, why they wrote them at all, what their effect on readers were—and, eventually, what consequences they had. It was an odd shift in perspective, because generally historians use texts like these as sources that tell what happened– “this is what occurred on Roosevelt’s safari” (or “this is what Roosevelt says occurred…”)—but putting them into context as desirable economic commodities in a transatlantic publishing marketplace really changes how we see them. By publishing, these hunters also came to dominate the middle-class recreational press, and that really matters. Among other things, it let their version of conservation sweep aside many forms of local and market hunting across North America: they had an international pulpit from which to persuade middle-class readers, because other hunters weren’t writing about what they were doing. 13 years from beginning to end—but happily I wasn’t writing that whole time, a lot of it was spent teaching! It started as a dissertation, but I was lucky enough to get a postdoctoral fellowship to the Huntington Library, where I found a huge amount of great new material that had to be thought through and incorporated into the MS. I also had fantastic press readers who asked me some really challenging questions, so it got reworked once again because of that. It’s a much stronger book as a result, but I’m glad I didn’t know it was going to take this long when I started it! As far as process, in grad school I wouldn’t allow myself to check email or go online until my day’s writing was finished, but once I started working full-time I didn’t have that luxury. My biggest fear in revision was coming up with a good conclusion, but when the time came I found I knew exactly what I wanted to say. 3. 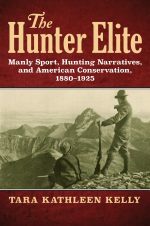 The Hunter Elite is the first book to explore both the international nature of American hunting at the end of the nineteenth century and the essential contributions of hunting narratives and the publishing industry to the North American conservation movement. Why do you think these topics have not been previously explored? I might say it’s the first book to explore these topics in the way it does? I’ll tackle the second part first: ever since John Reiger’s foundational work back in 1975, we’ve known that the recreational press promoted conservation, but I investigate the why and how of that—the reasons this group of hunters chose to write and publish stories about their experiences, how they recruited editors and publishers as allies, and how readers were urged to participate. I also argue that the content of the narratives—the ways hunters consistently linked wilderness experience to manliness, self-discipline, the pioneer past, and Americanism—played a huge role when they began talking to readers about conservation, because they brought the same rhetoric to bear. And at that point they really did control the national recreational press, especially Outing Magazine, which was the fastest-growing periodical at the beginning of the twentieth century. As for the international role, I find it odd that it’s been neglected (except for Roosevelt’s safari). Historians like Greg Gillespie have been doing great work on British hunting in North America, and there’s always been a lot of writing on the continental U.S. West, but by 1900 big game was becoming so scarce that Americans seeking trophies had to travel to Alaska, the Canadian Rockies, British East Africa, or India, so it made sense for me to follow them out there. I’ve always loved comparative history and I got so much out of analyzing the very different ways British and American hunters described their experiences, even when they were on the same hunting grounds or even the same expedition. I also got to go in-depth on the logistics of the safari and the unbelievable skills of African gunbearers, but with a different perspective, since I compare them to Alaskan guides and look at how, on both continents, they negotiated with, befriended, and battled the wealthy hunters who employed them. Canada and Newfoundland are in the mix as well: it’s fascinating to watch U.S. hunters describe Canada as an untouched wilderness while British hunters insist that it’s just another colony. The hunter elite also influenced or even wrote game laws in Canada and Newfoundland, as well as addressing hunting in Mexico, so it really is a North American story (with occasional forays through Africa and India). 4. When most people think of hunting in this period, they think of Theodore Roosevelt. How does he feature in the book? The problem with Teddy Roosevelt isn’t just that he’s incredibly anomalous compared to all the other American elite hunters, it’s also that he wrote so much that he still dominates our impressions of elite hunting at the turn of the century. I hope that my book contributes to moving the history of elite hunting out from under Teddy’s shadow. The vast majority of American elite hunters in this era celebrated stalking game on foot as a display of manly self-control, and pointed to their refusal to kill even as many animals as allowed by their hunting licenses as proof of self-discipline; in their narratives they avoided discussing violence, war, and imperialism; and many of them liked and respected their guides. Some elite hunters were also women! You can’t see any of that without shifting out from under TR’s shadow, however, and I think sometimes historians working on the culture of the period have assumed that he was representative of elite hunting. Instead he was, as Christopher Lasch once said, compelling but rather bizarre. I certainly discuss him, especially when it comes to conservation, but I really hope this book helps to move the conversation on elite hunting away from this one man and over to the hundreds of other hunters, male and female, who were also publishing narratives of sport in this period. The story they were telling was equally influential and, I think, more interesting because it’s unexpected. 5. You mentioned conservation: what role did American hunters play in helping to establish national parks? As we know them today? Everything. If you like the national parks, thank a hunter—or rather go back in time and thank the Boone and Crockett Club. These guys understood very early on that parks would provide reservoirs for game that would assure good hunting beyond park boundaries, but, as time passed, they also came to see them as the last bastion for endangered animals. Remember, this was the generation that saw the bison driven almost to extinction: Owen Wister, urging Outing’s readers to support conservation, reminded them that “[You may] say that it is our grandchildren who will not find much trout fishing, but bear in mind that men not yet forty have seen the buffalo like armies along the banks.” The hunter elite were directly responsible for creating Glacier, Denali, Mesa Verde, Wind Crater, and what became Grand Canyon National Park, and barring hunting in Yellowstone. They also pushed through game-changing legislation, including the Antiquities Act, which gave presidents the ability to preserve these beautiful places without Congress’ consent (Obama was the most recent president to take advantage of that). At the same time, conservation in this era had its darker side: saving wild places and animals often meant placing restrictions on local people as well as market hunters, and non-white and working-class hunters were the most likely to feel the impact. What interests me most is how the hunter elite used their power in the national media to disenfranchise local hunters by reaching out to middle-class readers, creating a constituency out of them, and then mobilizing them on behalf of conservation. It’s a different way of seeing the power they wielded than just examining political position and legislation, and it’s one of the parts of the story I’ve uncovered that’s most relevant to the current day: the role played by the media in deciding the outcome of conflicts over nature is really important to environmentalists and political scientists as well as historians. 6. What was the most challenging aspect of writing the book? I’d probably have had a different answer at each stage of it, but one thing that strikes me is that I had the bad (or good) fortune to straddle the massive change in availability of these texts that we’re experiencing right now. When I wrote the first draft, everything I used was from libraries and archives, but by the time I was revising for the press almost all those texts—and some I hadn’t encountered before!– were available to me on my phone. There had to be a point where I took a deep breath, reminded myself that more is not always better, and stopped adding material. The availability is great for teaching (and for writers without travel funds), but I wonder sometimes how overwhelming it is for grad students just starting to explore a topic—archives are finite, so you can always reach the end of the file, pat yourself on the back, and go find a pub. 7. What was your favorite part of writing the book? I also kept an eye out for the aside that reveals more than the author intended. The safari, for instance, is often framed as being about subjugation, with white masters and black servants replicating the ugliest of race relations, but Winthrop Chanler (unintentionally) reveals that his workers had their own idea of that relationship when he insists on travelling across a lake on a creaky raft: his men lined the shores, he writes, and “shouted cheering words to us, such as, ‘Look out for the crocodiles!’ ‘If master dies, who’ll pay us.’ These cries, added to the dismal chill of the air, almost caused me to turn back…” Some elite whites might have liked to imagine they were acting out a story of mastery, but at least one worker on that safari knew it was all about his paycheck! I hope my analysis is always clear, but I love being able to share the words of these hunters and their guides with readers; they’re a large part of why this genre became so popular in its time. 8. What surprised you the most as you read these narratives? I think the amount of evidence I’ve found about big-game hunting women. There’s been some great work written on women’s hunting, but it tends to focus on the handful of women who published narratives: there weren’t many, and they were mostly single, so that’s been our image of female hunters. Reading men’s stories, though, I discovered women hunting everywhere, most often with their husbands, but also with their fathers or brothers; these women didn’t usually publish, however, so they’ve been invisible so far. It upends a lot of what we thought. Charles Sheldon, for instance, took his society bride, Louisa Gulliver Sheldon, hunting, since he thought she would enjoy nothing as much as shooting a bear. It sounds like a hell of a honeymoon: at one point she was almost swept out to sea when they were crossing a river; she managed to keep her rifle above water, though, and displayed it proudly to Charles when he hauled her safely to shore. In addition, he notes, she turned out to be “perfectly cool, even more so than most men,” when dealing with bear. This is actually typical; most men hunting with their wives or daughters have nothing but praise for them. Women’s published narratives are fascinating as well, because they conform to some elements of the men’s stories but openly challenge others—and even though far fewer women published than hunted, their books were hugely popular. They published in the recreational press as well (helpfully reminding other women, for instance, to discard their corsets before mountain-climbing). 9. If you could have any one person read your book, who would it be and why? Living or dead? Charles Sheldon, the most respected American big-game hunter and the force behind Denali National Park: I’d love to know if he thought I got it right! He could share it with Louisa and maybe I could ask her why she never published her own version of her bear-hunting adventures. 10. What are you reading now? In fiction, I’m almost through Nick Harkaway’s Gnomon, which is fantastic, like The Name of the Rose if it were sci-fi. In history, I just finished Mark Bowden’s Hué 1968. I’ve taught the Tet Offensive and also worked in Vietnam so I was fascinated to read a book that draws on sources from both sides of the conflict. Tara Kathleen Kelly is an independent scholar with a PhD in American history from Johns Hopkins University.